Design, Development & Support – The Digital Architects, Inc.
For every website we build, large or small, we adhere to a multi-step process stressing collaboration with you, our client. 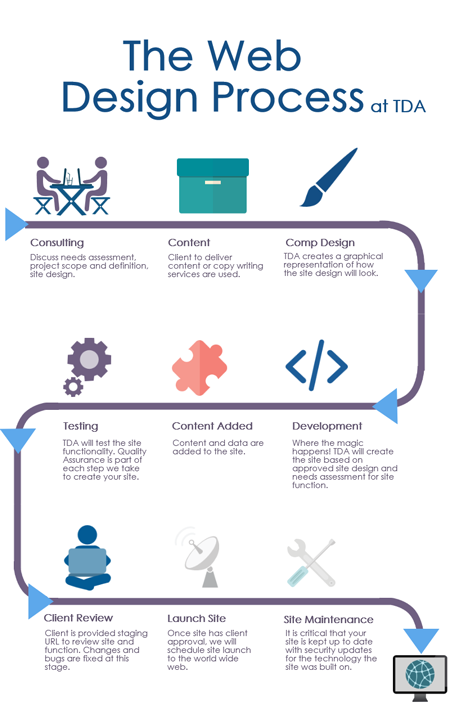 The custom website process allows us to deliver you a solution on time, within budget, and of exceptional quality. Superior web design is nothing unless you have customer service to match. TDA prides itself on the business partnerships we’ve fostered over the years, and the cornerstone of those relationships has been our commitment to customer support. Offering experienced counsel and hands-on assistance, TDA is available to resolve any issue that may arise. Whether you have a question about cost or security, usability or troubleshooting, our team is there to respond.